While watching the first of two Game 7's on consecutive nights, we began to reflect on some of the most memorable moments of Round One. 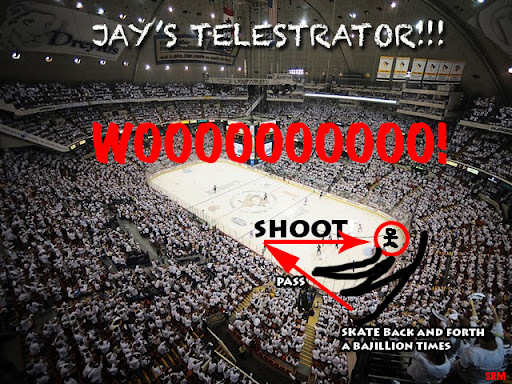 The image that kept cropping up was this play by none other than the Reebok pitchman, Sid the Kid. Every time we watch it... it's just unfair! For you Google Map users, below is a turn by turn diagrammed snapshot that we discovered on the extremely entertaining Pensblog. Of course there have been plenty of highlights (Halak's Game 6, Satan's bedeviling of Miller, Sharks not folding, Boucher's 4 wins) and lowlights (Hossa's shove, Sutton's elbow, Canuck Puck Propulsion) thus far, but no single moment tops Sid's display of dangling.